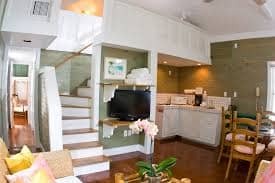 Simonton Court is one of loveliest guesthouses in Key West. The rooms are spacious with high ceilings and hard wood floors. There are several pools on property and the gardens are heavenly. Each room has a style all of its own. The gardens are immaculate and the architectural style of the historic mansions are exquisite.